Martic Elementary School students are learning about farms, food and the environment through hands-on experiments and activities conducted inside a brightly colored trailer parked outside their school. 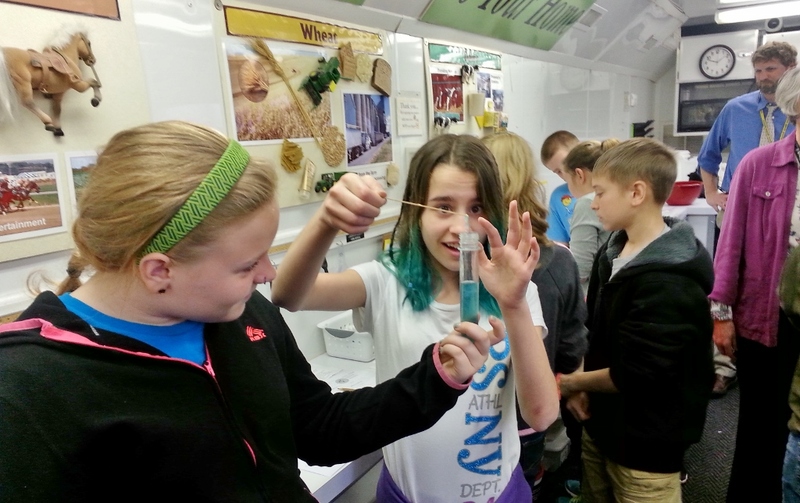 The Mobile Ag Science Education Lab is visiting Martic this week after making stops at three other Penn Manor schools earlier this year. Martic students in all grades are learning from ag educator Ruth Smith about seed germination under different conditions, how to create crayons from soybeans and how different kinds of soil retain and utilize water, among other lessons. On Wednesday, sixth-graders were extracting DNA samples from bananas and learning the role DNA plays in plants. Students in all grades are exploring the scientific method inside the 32-foot trailer, which is equipped with 12 work stations. The mobile science lab is sponsored by the Pennsylvania Friends of Agriculture Foundation, a division of the Pennsylvania Farm Bureau. 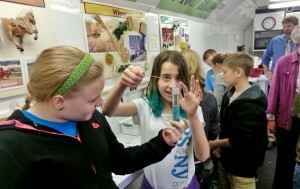 Martic Elementary sixth-graders extract DNA samples from bananas inside the Mobile Ag Education Science Lab parked at the school.